August 15, 2014: Sometimes the "never give up" attitude is more curse than blessing. 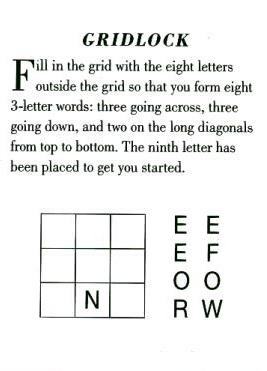 The current puzzle is an example. This recent Mensa calendar puzzle is the 2nd example of this puzzle type and prompted me to create Square Word Grids, Version 2.0. allowing puzzles to be manually entered. (The original puzzle was hard coded to produce the default puzzle.) Version 2 of the program also adds the ability to save and restore puzzles. However integrating creation of puzzles with the original solving functions turned out be much harder than I anticipated. I fought with it all week and I'm still not happy with the result. The puzzles are not likely to be very popular and I'm ready to move on to other projects. The "PuzzleFile.ini" file included with the downloads contains this puzzle for loading and solving yourself or letting program find the solution. To add to the disappointment, it turns out that there are no solutions using words in the included medium size dictionary but two solutions using the large dictionary! "C'est la vie", I guess. August 30, 2014: I just renewed the DelphiForFun domain names for another year, but this may be the last. The clock keeps ticking and, as I get older (and slower), it seems as if it is ticking faster. At 75 years of age, my "Bucket List" has more items on it than I can realistically expect to satisfy. Next week is the 14th anniversary of the website started in September, 2000, so fifteen is a good target. I'm lowering my program posting objective from one a week to two a month to ease the transition. Here's a simple Beginner's level program I wrote this week in response to a user's email asking how to remove lines shorter than 199 characters and truncate lines longer than 199 in a text file. The barebones program CopyTruncateStrings uses about 15 lines of code to accomplish this and a few more lines to display the counts. Lots of room for adding features, but hopefully it does the job for him. The link above is to our "Beginner's" webpage; scroll to the bottom to find and download the program if you are interested.